"This neighborhood was always rough… but there's something different going on." They're back for more! Warner Bros has debuted the first trailer for Barbershop: The Next Cut, known as Barbershop 3, the second sequel continuing the Barbershop story about the Chicago crew's shop. The first movie opened in 2002, with the sequel in 2004, and they're finally getting back into the mix with this third one. Pretty much everybody is "back for a fresh cut." Ice Cube, Cedric the Entertainer, Regina Hall, Anthony Anderson, Eve, JB Smoove, Lamorne Morris, Sean Patrick Thomas, Tyga, Deon Cole, Common and Nicki Minaj star. This isn't really a franchise we follow nor is it one of our favorites, but some of you might want to check this out. It's been more than 10 years since our last appointment at Calvin's Barbershop. Calvin (Ice Cube) and his longtime crew, including Eddie (Cedric the Entertainer), are still there, but the shop has undergone some major changes. Most noticeably, our once male-dominated sanctuary is now co-ed. The ladies bring their own flavor, drama and gossip to the shop challenging the fellas at every turn. Despite the good times and camaraderie within the shop, the surrounding community has taken a turn for the worse, forcing Calvin and our crew to come together to not only save the shop, but their neighborhood. 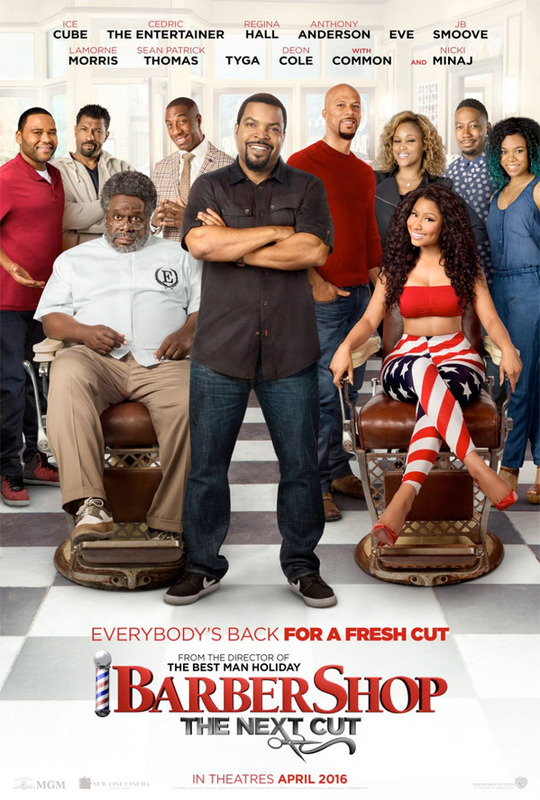 Barbershop: The Next Cut is directed by veteran filmmaker Malcolm D. Lee, of The Best Man, Undercover Brother, Welcome Home Roscoe Jenkins, Soul Men, Scary Movie 5 and The Best Man Holiday previously. Warner Bros will release Barbershop 3 in theaters everywhere starting on April 15th, 2016 next spring. Anyone interested? No Tyler Perry? Sign me up. Yass! Love Nicky Minaj, such a good actress. Some good actors in there somewhere I think, seems almost like a Christmas movie. Keeeep Up FirstShowing, latest trailer for Captain America: Civil War is out. Juss sayin. Worth it for JB!! !~ That dude is the best. Who asked for this crap? Looks awful. Why Ice Cube? Why? would be happy if I can watch with high quality and supports subtitles .. please help me where can I get it ? ?